Add more distinction between discussion forum posts to distinguish them from each other. It would be very helpful if discussion forum posts could be darker around the edges to show a distinction of the post as well as the reply to a post being more indented. It would also be helpful if there was more space between the replies, because it can be difficult for users to separate the discussions in their mind to know which post they are in fact responding to. A student mentioned having a hard time separating out which post is separated, and I can see how it could be hard for someone with eye problems as well. If students could "name" their reply to the original post that would be great, as a way to mimic the thread style forums. I strongly agree that students being able to name their replies would greatly increase the usability of discussion forums. For example, I use a General discussion forum for students to post questions akin to those they would raise their hand to ask in a traditional classroom setting. With the current formatting of discussion forums in Canvas, it's very difficult for students to look at a glance and see if the question has already been addressed. The ability to create a reply for the names (like the subject line of an email) would really help this and likely reduce redundancy in repeat questions asked as well as enhance the utility of the forum to students as a living resource. EXACTLY what I was replying to Elizabeth (below) about! This is a missing piece indeed!! from one of my colleagues - A lot of discussion board assignments require a reply to someone else's posts. It can be hard to distinguish a "reply" from a "reply to a reply" in this context. More distinction between levels would make grading and posting either. Basically, I find that the discussion board is missing a "layer". There are essentially no "forums" only threads, making it difficult to return to a discussion and find a particular sub-topic within a topic. We use the discussion board very heavily in our distance graduate level program and our students have expressed their frustration with this. Yes! We just spent almost an hour in a chat with Canvas this morning trying to figure out a work around. I tried just me creating the 'forum' (via a discussion thread) and having students reply to that, but it's totally unmanageable to sort through - for me and for them. I really hope we're able to get this resolved quickly. For example, even the indentation on THIS discussion is more intuitive than the one in Canvas! Yes, I agree. The indentation on this discussion forum is definitely more intuitive. For general discussion forums, I have started creating two separate discussion forums divided by the alphabet of their last name (A-L) (M-Z). I have found that this reduces the size of the forums. However, if one wants to grade the posts, because there are two discussion forums for the same topic, points would need to be added separately. Otherwise, students will show an extra discussion forum! Otherwise, now I am doing more small to mid-sized groups, which helps reduce the size of the forum. I will say a positive to not having threads like Blackboard is that as the Instructor it is easier for me to show my presence to the class when I reply. Also, I have noticed increased comments with the layout of Canvas discussions since students see more posts. With traditional threads like Blackboard, conversations are more closed. I hope there is a great fix that will maximize communication. Along the same lines, we need to distinguish between the "reply" link at the top of the discussion which starts a new thread within that discussion and the "reply" link at the bottom of each posted message for applying to that particular message. Use a different name for each application because currently it is very confusing for new users. Perhaps use "start a new thread" at the top of the message list and "reply to this posting" to reply to an existing message. There is no reason that we can't be more clear here. This is the opening week of the Franklin Pierce roll out. One constant refrain in the feedback that I am getting is the difficulty in differentiating the threads and the replies. In a format where the threads are acting as class discussions, being able to follow a conversation is very important. Thank you for considering this idea. BTW...We posted a facebook question to our online students through Penn State World Campus. The number one complaint was the discussion forums. You can see the feedback at Penn State World Campus. Hello Lisa - I visited the page you shared and noted about eight comments about discussions that are negative. From other comments it appears Penn State is currently transitioning from another LMS. Jeff - Yes. PSU is migrating from Canvas and this is just a first semester of the rollout. PSU World Campus has about 170 courses in the first semester, so this is just a small portion of the students using it. Overall, the feedback has been very positive. They also had a lot of great discussions on this topic on their twitter feed as well. First impressions mean a great deal and you are doing a great service by capturing these. We finished our migration by May, 2015 and the experience since has been nearly wholly positive. We did have a group of faculty elect to discontinue using a third-party integration for Wikis/ blogs/journals/discussions as there was no speedgrader or rubric linkage. That is the only bump in the road that stands out. I mention this only to note that alternatives to the Canvas Discussions exist, and while such tools provide benefits, their use comes with a cost and loss of functionality. I agree that the discussion feature could use help!! This post has more than one idea so I am split on how to vote. Having a repeated title for each post would be rather pointless in my view as I've experienced more than a decade of most students not renaming the default thread title when given the chance (in a different LMS). So the pointless, repetitious titles took up space and detracted from the experience. Good riddance! Then again, the idea about indenting and differentiating between threads a little more has piqued my interest and can only be seen as a functional improvement. I agree discussions could use some improvements. Here are two feature ideas I had. Unfortunately they got archived. I made a new feature request for the subject lines. If it gets to the voting stage please vote for it. Thanks. another ancillary thought: the basic "Reply" field is way to small and insignificant - it needs more graphical emphasis. Hi everyone - I was directed over here by some former colleagues to give some feedback regarding the Canvas discussion. I am a part time graduate student and this is my first time using Canvas for a course. I am fairly tech savvy, so I just hacked the css to solve a short term problem for me - which is to graduate and do well in the course. In my graduate level course, the discussions typically go 3 levels deep (reply to a reply to a reply) and occasionally go 5 levels, so the white space indentation was not providing enough visual separation to figure out who was responding to what. I think everyone else has already expressed similar sentiments, so I won't repeat those. You can see my "hack" at Canvas Discussion Visual Separation » jinsungpsu using a Chrome extension to inject CSS. Love all of the ideas here. I don't plan on working in the Discussions area of Canvas for at least six months, so we should probably archive this idea at some point, BUT I do have a proposal for voters on this thread in the mean time. I'd like to see your own sketches for a new and improved UI in Canvas Discussions. Feel free to base it off of user experiences you are familiar with or ideas you've picked up from folks on this thread (i.e. clear separation, darker lines, etc.). I know we're not all artists, but if if anyone on this thread wants to draw something up and post the image here, I will send you... wait for it... a Canvas sticker! Looking forward to seeing your ideas. Happy Valentine's Day! Thanks, Allison! What a great idea to get some UI design ideas from the crowd. I'll be using Canvas for an orientation course at Penn State this summer (already using it in my upper levels) and I'm very concerned about making sure I conduct the discussions in a way which is as easy to follow as possible as many of the students will be new to Penn State, new to online learning, and certainly new to Canvas. I wonder if you or anyone else following this discussion thread have suggestions for the best way to structure discussions. Generally, we have a handful of students responding directly to an assignment prompt and the remainder of the students replying on those posts each week. Total enrollment is small, maybe 20 or less for the summer. Should I start the thread each week and have them reply? Or, should I let them do their own threads and then archive those as we go so the list of them doesn't become too long? Are there other options. What I wouldn't give for FOLDERS in the discussions in Canvas. I used Canvas last semester for three online classes, and I decided I had to make changes to the way I used the discussion forums due to the forum length. This semester I divided up "whole class" discussions by last name (A-L) (M-Z). This significantly reduced the length of the forum, thus less scrolling. Students are more likely to scroll to the last post when the length of the forum is manageable. I encouraged students to view posts from the other forum. Students also enjoyed the small group discussion feature. A benefit from the way discussion forums are structured in Canvas is that students are more likely to view more posts because posts are on the same page. The benefit in my opinion is that they see more ideas and thoughts from other students. I noticed with Blackboard discussion threads that some of the threads may only have a few views by other students. This created more of an environment of isolation whereby some students did not feel as a part of their learning community. In the Blackboard threads, I did more work to show my presence to students. Depending on my role in a discussion forum, with Canvas I can simply show my presence by just posting a few times in a "whole class" forum. All students "see me". In Blackboard discussion threads, unless a student opened up the thread I posted in, the student may not "see me" as present in the forums. If we have 20 separate threads for each student, it is unlikely that every student will view more than a handful of threads. This is what my observations were in Blackboard as an Instructor and as a student. And that's it! Hope that's helpful for those of you anxious to have a more 'threaded' visual cue in your own Canvas instances! try for our discussion forums. Love it Ephraim Ross! Thanks for sharing - so excited to try this! Ephraim Ross - just a follow up thank you for this. On our iteration the grey vertical lines touch. Just for clarification purposes... We should not expect any changes to the discussion feature for at least 6 months? It's difficult to navigate between sub-topics inside a discussion. We'll archive this for now, but please feel free to continue adding your comments and insights. Also, if there is one particularly problem that stands out as the most important to solve FIRST, feel free to post a product idea devoted to that specific problem. Allison, you asked for our own ideas and sketches of an improved UI for the Canvas Discussions... honestly, I think the Jive discussion approach you're reading this on is pretty stellar. I would not mind if canvas discussions looked like these at all! Is there any way that we can make discussion threads less challenging to follow? In a previous LMS all the discussions that were replies to an initial post were threaded and one would need to click on the initial post to read through the discussion thread. Now, the indenting for the discussion thread is not easily distinguishable and a discussion conversation scrolls on forever. Is there a way to not view all threads at once? Is there a way to have a certain number of responses and then click to a next page to keep reading responses? I'm just trying to find ways to make it less confusing for the student and faculty to follow the conversation. Heather, I have been separating my discussion forums, which has been helpful with maintaining the conversation scrolling. I usually do this by last name (A-L) (M-Z). I also use small groups, which students have enjoyed. The one thing I did not like about the traditional threads like in Blackboard is that it was difficult for me as the Instructor to connect the conversation to the whole class. A student could say something in one thread that I clarify in his/her thread, but other students would not see it because students do not read all of the threads. I would then need to create a discussion forum wrap-up announcement so I could provide students with highlights of points made by students including any clarifying information. I really like the idea of open discussion forums. This I believe encourages students to read more posts than they would in a blackboard thread. I am seeing increased discussion forum interactions in Canvas versus my experience with using Blackboard discussion forums. This is the # one complaint that our instructors give is that the discussion board is very difficult to use. That it would be easier to format something like the pic below. The topic with it's posts could be in a separate box. Thank you very much for considering this one! I too agree that this needs to be added. I will check back when voting is open. Douglas, just to clarify, voting on this feature has already been opened, and was closed on February 3, 2016. Inasmuch as the idea has already landed on the radar of the product team, it's neither necessary to resubmit it nor to reinstate voting. I did not note that the voting had already closed. What is the timeline for this since it was voted on? I know someone said six months or so. Those of us (many colleges) who came over from Etudes regret that Canvas is not able to do this function. Our students are suffering as the current canvas discussion layouts and functions are no where near the caliber of Etudes. It was my understanding that once something was voted on it would move forward and not simply be archived for another time. Someone made this suggestion as a work around. This seems to make more of a distinction, not sure if it will work for you, but it might be worth a try. Here's the link. Not interested in writing code! Need forum and topic levels and/or quote/reply function that works well and is not confusing. Thank you. Understand! That was our preference too, still hoping they'll develop the discussions to function much easier and similar to Moodle which is our previous provider. The area of discussions seems to be our main concern with Canvas. Hi Cherine. I'm sorry that this is causing frustration for you and your students. The update provided by Allison is still current. There are no new updates at this time! Allison's timeline stated that it would be worked on in 6 months and that was 8 months ago. Could we please have an update? We are also not happy with the current look. In Allison's update, she stated that"I don't expect to make any significant enhancements to discussions during the next six months." The 6 month benchmark that she used was a minimum, and a benchmark that we use when determining whether an idea will be archived or not. If it looks like a feature will not be worked on for at least 6 (or more) we place it in archive, which is like a holding tank. The idea can come out of archive at any point, however it does not receive regular updates. How does the feature idea process work? goes into further detail on this process. Thank you for the clarification Renee Carney. The program I work for is 90% online and we depend heavily on the discussion tool. For the time being we are in another LMS, but we will be fully transitioned to Canvas by next fall. I'm disappointed that this is not being worked on. Is there a way to submit multiple ideas - like a list versus voting on each and every little tweak? Examples: Groups show zero posts until you click to another level where you can see the number of posts per group. And, after you are done in that area it takes you back to the class syllabus, not back to the discussion area. I have noticed many such things and have a list I'm working on but I don't know how to submit these types of feedback. Secondly, I hope that whomever makes the Canvas development discussions is aware that voting is just a very small fraction of the groups who want these ideas to move forward. Most faculty simple give up to learned helplessness and the students suffer by being more confused and lost in the class. I love workarounds, but some of these problems both major and minor do not seem to have a satisfactory work around. Yes, my take is that distinctly separate ideas require unique initial posts. Oh yes, some are quite aware of such aspects of the voting. Some schools are quite adept at 'rallying the troops' to increase the count. If you design a different discussion board, can you create a beta or a testing environment so we can give feedback before it would go live? So many of our instructors heavily depend on the discussion boards; especially the photography and graphic art classes. Because the current discussion board is very difficult to use, they are holding onto our last LMS as long as they can during through the transition to Canvas. Other than that, most people (including me) are loving Canvas, so kudos. I'm really not certain why Canvas decided to "break" this common functionality. So, while I would like to see this helpful change made, it just isn't going to fix the core problem: Canvas Discussion aren't a discussion forum, rather they're a convoluted commenting system. My suggestion is to integrate another open source solution (such as Vanilla Forums, Discourse, or even phpBB). These are all tried and tested forums that stand up to the highest level of traffic and throughput (for instance, I was once part of a very active open source community of around 40,000 users and phpBB never let us down). Perhaps post this suggestion as a new idea? And do link to it from here. I noticed that this idea has been in the "product radar" stage for quite some time, with the last reply from Canvas in March 2016. Our fully online classes utilize the discussion forums as the foundation for instructor-to-student and student-to-student interaction, and so I cannot emphasize enough how it important it is that students and instructors alike are able to engage in discourse with ease. I do find it interesting that in the forums Canvas utilizes to discuss feature ideas with its users is the exact change in discussion formatting we're looking for. If it's here, why can't it be included in discussions for our courses? The Administrators of Canvas at my University have implemented some "work arounds" for this issue, and this has really enhanced the ability to dialogue in discussions. I am not sure what specific coding they used, but the overall image looks similar to some coding shared by Ephraim Ross on May 25, 2016 on this page. Your University Administrators for Canvas may be open and willing to implementing these enhancements. I would append this by allowing collapse and expand features for discussion forums. At the grad level, discussions are an essential part of coursework and having to navigate a multitude of lengthy posts can become taxing, particularly when participating in group discussions and multiple courses. But, overall, allowing different color schemes would be helpful. The little blue dot used to indicate read/unread posts is pretty useful, but highlighting an entire unread comment in dark gray or something would make it easier to distinguish. Basically, the discussion forums have a lot of room for improvement. Not to say they're horrible now, because they definitely function well, but some basic features would make them leagues better. More differentiation between initial posts and replies is still needed. I would also suggest highlighting instructor replies to make it easier for instructors to track their replies and not miss any posts unintentionally. Hi Ken Fairbanks, I like your suggestion of ways to highlight Instructor replies. I see comments within discussions in the Canvas community where there are icons that are included by the names of posters. I wonder if there is a workaround someone has created to add icons next to our names as Instructors, similar to how there are icons next to posters in the Canvas Community discussions. I'm absolutely distraught that so many years have passed (since 2015 at least) and there has been no improvement in the readability of the discussion board. It's the absolutely worst discussion board layout that I've ever seen in my 35 years of using discussion boards. Canvas should be ashamed of forcing such a horrible format on their users. I share this perspective!!! There are several things I like about Canvas, but the whole discussion infrastructure is a MESS! It is 2019 and there are more robust tools on social media everywhere! There needs to be better differentiation of replies on threads, there needs to be subject line, there needs to be an option for a tree or grid view, there needs to be an ability to @ people, to get a notification specifically when someone has replied to something you have posted, to be able to tag or hashtag posts with key words, to be able to "flag" a post in some way so that if I want to read everything in the discussion and know that later I want to go back to reply to 3 posts, I can find my way back, there should be better options for sorting and collapsing posts (hence why a grid or tree view post would be helpful). I teach a graduate course where the discussion used to be the lifeblood of the course. We are 1 week in on this new platform and it is simply awful, to be perfectly frank. I like my pedagogical approach and technology is supposed to be a tool, not drive the pedagogy, but the tools to support the pedagogy just are not there. Having poked around on this idea page, I notice the discussion framework on this page has several of the ideas I just mentioned (except the grid/tree view option or subject line) - so there must be some developed infrastructure or at a minimum appreciation for the value of these features. How can we change this? I was at a faculty retreat and practically every person said they really liked Canvas but the discussion tool had significant limitations. I'm pretty sure my students would happily sign a petition to beg for better discussion navigation features if I offered them the chance. Can students log in to this site an upvote ideas along with faculty? The fact that many of the discussion-related threads I've seen here are years old with little change seen is seriously depressing Should I start a new idea thread that includes a suggestion for a complete discussion tool overhaul rather than separate one-at-a-time feature ideas? Yes, students can vote. In some cases, hearing from students has more impact than what teachers have to say. No, you should not start a new idea thread. As this one is in the top 10%, a new one would get redirected to this one and archived. Kitchen-sink requests are similarly archived as it becomes difficult for people to vote for it (a person may favor three of the four things but really not want the fourth one). See How do I create a new feature idea in the Canvas Community? for more information. I will add that when I visited Instructure headquarters in April 2017, they were looking at totally reworking communications. That included discussions, conversations, submission comments, and probably some other things. They have a some other major projects going on (Quizzes.Next has been underway for more years than I want to think about) that they will want to get some of those done before they tackle more. If you have too many big things, then nothing gets accomplished. If you're looking to redo discussions as part of a major overhaul, you don't want to spend resources tweaking it now. You can see a list of the major projects that are in the works by going to the Canvas Studio and scrollling down a little. Even though a communications reworking may not be on the list, that doesn't mean that Canvas isn't thinking about the best way to handle it. Hi Russell Pfau and Jennifer Johs-Artisensi, I wanted to mention the Canvas Admin at my University was able to create a workaround where our discussion forums now have more distinction. 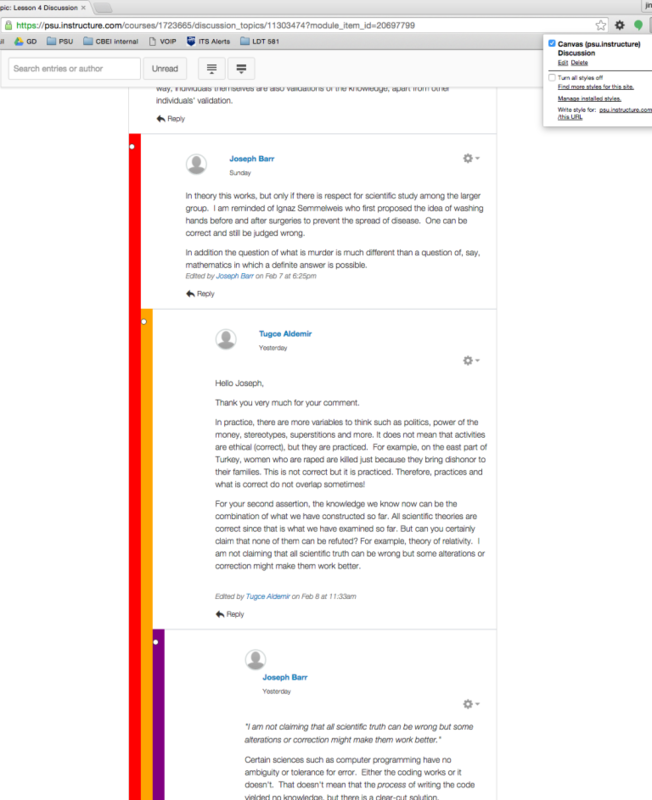 I am not sure what specific coding they used, but the overall appearance of the discussion forums look similar to some coding shared by Ephraim Ross on May 25, 2016 on this page. Your Canvas Admins may be open and willing to implementing these enhancements.